Several hundred people have gathered in front of the National Assembly in Paris in protest over a new bill that would grant French intelligence agencies more power to track suspected jihadists-to-be, thus potentially jeopardizing online privacy. 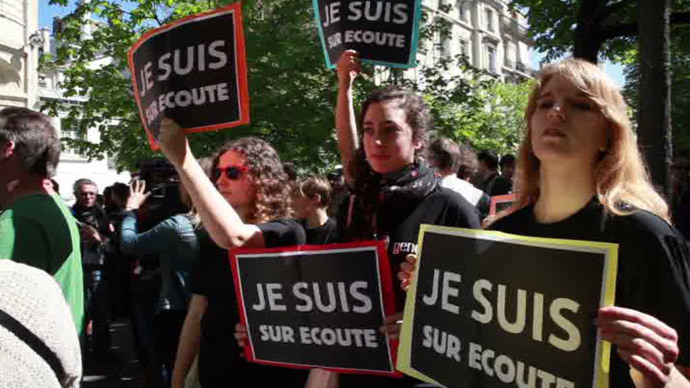 Protesters, holding signs “#UnfollowMe”, “Protect our freedoms” and “I am tapped” gathered in the center of the French capital to voice their concern over a bill that was debated in parliament on Monday. The new legislation turned out to be controversial among civil liberties advocates, as well as France as a whole. “This is a bill that touches the very meaning of the constitution,” said former minister of housing Cecile Duflot, The Local reported. Meanwhile Prime Minister Manuel Valls defended the legislation and reassured parliament that the bill has nothing to do with the US Patriot Act, introduced after the tragedy in September 2001. “The critics or the posturing that refer to a French Patriot Act or the stench of a police state are outright lies and irresponsible in the context of threat we face,” Valls said. “It is high time that France had a legal framework similar to that which exists in most Western countries,” said Valls. The French government has been considering the extension of intelligence agencies’ potential with no need to grant a judge’s permission to tap phones and track emails, as well as bug flats with microphones and cameras since the beginning of this year. Manuel Valls revealed plans to boost anti-terrorism strategies after the Charlie Hebdo tragedy. France will also employ 2,680 extra anti-terror operatives with a €425 million increase in funding, according to the prime minister. Since January an extra 10,000 troops have been deployed on the streets across the country to prevent possible attacks, after three Islamist extremists killed 17 people in a series of attacks in Paris.